Welding for battery manufacturing requires unique technology and expertise working with metals and metal combinations which are not easy to weld. Whether your company is developing bus bars, battery and capacitor arrays, or battery cases, EB Industries has experience collaborating with customers to develop amazing solutions. 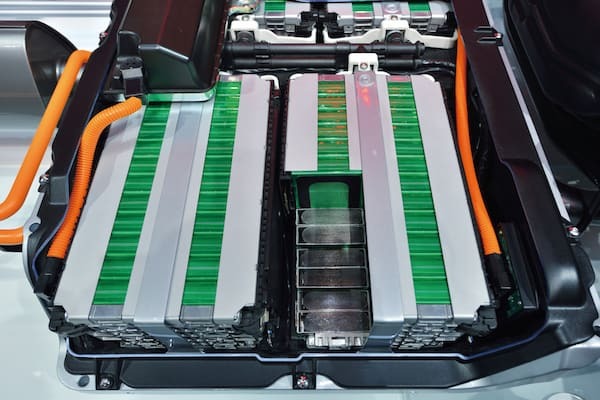 The battery industry presents unique challenges to manufacturing, particularly with the trend towards lighter and more efficient batteries. EB Industries has been helping companies for over 10 years to develop unique welded solutions to some of these challenges. The automotive industry in particular has been a huge driver in pushing engineers for ever lighter, safer, efficient, and less expensive designs. With the increasing proliferation of electric and hybrid automobiles, we’re increasingly involved in developing parts that have complex criteria involving size and space limitations, heat, power and safety requirements, and utilizing materials that make manufacture and prototyping problematic. The aerospace and defense industries are also innovating, requiring new thinking for applications such as drone batteries, weapons power systems, or wearable battery packs. From a welding engineer’s perspective, we have found that the challenge usually comes down to finding viable ways to join copper, aluminum, or some difficult dissimilar material combination. Copper is a wonderful electrical conductor and is often at the center of many battery designs for terminals or bus bars. However, copper’s high thermal conductivity and low melting point make it difficult to weld. It can be joined with fasteners or brazing, but these methods can have limitations when weight, form factor, a thermal management are critical. Aluminum is another material of choice given its low cost, light weight, and good thermal conductivity. However, certain alloys of aluminum have a propensity for hot cracking and are very difficult to join. A perfect solution for many battery applications would involve welding copper to aluminum, and we’ve managed to weld these materials together, but the resulting joint is brittle and impractical. As an alternative, hybrid alloys or clad materials are used. These materials are great and solve many challenges for power distribution and thermal dissipation. However, each combination has its own unique challenges when welded, cut or formed. The value we ultimately provide engineers and manufacturing companies is our decades of experience solving the challenges described above. The design of a bus bar is a balancing act between current handling and heat dissipation capability, and size and weight constraints. Bus bars are often made from copper, nickel, aluminum, and combinations of the three. Which material selected depends on how best to balance all the requirements. We’ve cut, formed and welded all of these materials. We also have significant experience working with hybrids, such as welding copper to nickel or using nickel-copper cladding. The welds and cuts in these sorts of applications are notoriously difficult due to melting point and conductivity differentials of the materials. We’ve developed proprietary techniques and procedures which allow us to weld nickel or nickel clad bus bars to copper transitions at high production rates with no loss of quality. Typically, bus bars are flat strips, solid metal bars, or in some cases hollow tubes. However, battery array configurations are becoming much more compact and complex as engineers work to make more devices electric. Electric vehicles, in particular, are forcing engineers to design battery systems with complex form factors. To accommodate the design requirements, bus bars need to be bent, cut, and welded across three dimensions. Fortunately, EB Industries has high speed 5 axis laser cutting and welding capabilities, which are well suited to these sorts of tasks. Additionally, the high degree of automation at EB affords rapid prototyping and fast iterations of your components. As power demands from high performance battery powered and gas/electric hybrid vehicles increases, there is a corresponding increase in battery power storage and output. A key development is the use of ultracapacitor arrays – networks of capacitors which are capable of quickly responding to power needs. The main difference between batteries and ultracapacitors is the mechanism of power storage. Batteries store energy via chemical reactions, while ultracapacitors use electric fields. Ultracapacitors have many advantages over batteries: Quicker discharge and recharge cycles, longer life, and consistent power handling across that lifetime. We’ve welded ultracapacitor arrays as well as hybrid battery/capacitor networks, and we’ve dealt successfully with the packaging and mechanical requirements that often accompany the specifications of an ultracapacitor based product. EB Industries is a pioneer in Hermetic Laser Sealing, which is the air-tight sealing of metal containers for critical electronic components that are destined for harsh environments. Our experience is this field has made a tremendous difference to our customers with battery applications that must be protected and precisely packaged. We’ve sealed batteries into a wide variety differently shaped containers made from a variety of materials. EB Industries works closely with our customers to support their product development and production time frames, while meeting product requirements and maintaining quality and budget constraints. AllCell Technologies and EB Industries have partnered quite successfully on a difficult battery array requirement. The story of this collaboration was recently featured by The Battery Show in their trade show lead-up newsletter. Below are some of the companies we have supported in the battery industry.